Crucible Specialty Metals, as the name suggests, operates a specialty steel plant in Syracuse, New York. The plant makes a large variety of specialty metals, including tool steel, high-speed steel, marine applications, and stainless steel. Much of the plant was constructed in 1902 and has been in operation since that time. Making specialty steel products takes a great deal of energy. With the sharp increases in energy costs, including the natural gas needed to fire the plant ’s furnaces and steam boilers, it was getting very expensive for the company to manufacture its products. The plant ’s location in upstate New York did not help. Winter temperatures can reach well below 0°F, and winds can average around 10 miles per hour (mph), with peak winds over 50 mph. Ram Kondapi, chief project engineer, and Gary Schueler, senior project engineer, started looking for energy-saving projects to reduce the plant ’s energy usage. What they found was more than 1,800 feet of steam piping with insulation systems in poor condition. This piping ran from ½ inch up to 12 inches. Most of it was completely bare, and the rest was in poor condition. The insulation conditions were aggravated further by the condition and design of most of the buildings on the site. Piping installed in buildings normally benefits from warmer ambient temperatures, little or no wind, and no water contamination from rain. But Crucible Specialty Metals was not that fortunate. Its buildings were mostly uninsulated brick structures, built years ago (many around 1900). In several cases, the walls and roofs had large openings that exposed the steam piping to the full effects of the Syracuse winter weather. With help from the New York State Energy Development and Research Authority (see “Sidebar 2: NYSERDA Offers Energy-Saving Expertise”), work began on upgrading the company ’s steam-piping insulation systems in late 2004, starting with the insulation on one of the plant ’s most challenging lines: a large steam header located in a high, elevated pipe bridge that crossed a multitrack railway separating two of the manufacturing buildings. Once that difficult job was complete, the rest seemed easy in contrast. By the end of 2005, the new fiberglass insulation systems had been installed on about 46 percent of the piping. In early 2006, the task of determining if the plant was saving any energy fell to Schueler. He first looked at natural gas consumption; this was the fuel used for the steam boilers. Surprisingly, Schueler could not see a significant reduction. With a bit of investigation, he realized the amount of gas that was potentially saved was a relatively small component of the total natural gas used because a large amount was used in direct-fired furnaces for the manufacturing of specialty steel products. Schueler then looked at steam usage from 2000 to 2005, and it told a clearer story. 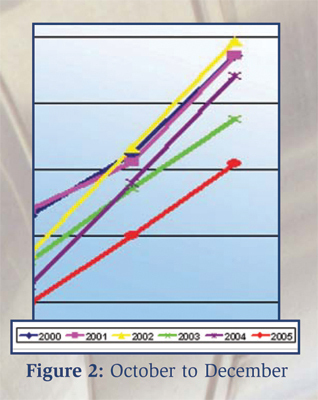 Figure 1 shows the plant’s monthly steam consumption from 2000 to 2005. At first glance, it doesn ’t look like the 2005 steam consumption was significantly different from the previous years ’. However, taking into account that many of the steam pipelines are shut down during the summer months and most of the insulation upgrades were not done until the second half of 2005, the chart looks more interesting. 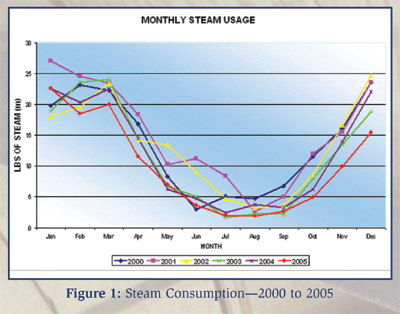 Figure 2 shows steam usage for 2005 to be significantly lower than in previous years. The average steam usage for corresponding months in 2000 to 2005 was 46.9 million pounds versus 30.3 million pounds of steam for 2005 usage—a savings of almost 36 percent. The results speak for themselves. Crucible Specialty Metals initiated an insulation upgrade project on its steam pipelines that saved a significant amount of both steam and money. The investment was returned in only 9 months (a projected return on investment of 131 percent). As an added benefit, the work made use of steam more controllable and will significantly reduce the facility ’s amount of GHG emissions simply by using less natural gas to heat the steam boilers, making this a true win-win for a progressive company. “Now steam usage is continually monitored, and measures are taken to reduce steam loads where feasible. This information is presented and shared with upper management at weekly cost meetings to highlight the economic significance of one of the largest categories of energy users in the plant,” explains Joseph E. Nadzan, vice president of maintenance and engineering at Crucible.